Home / News / How was that for a season? How was that for a season? The battle to be crowned champions of the Dorset Funeral Plan cricket league went down to the very last weekend. 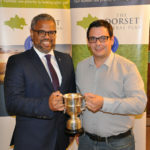 And it was Broadstone who pipped Swanage to the Premier League title and picked up their trophy at the annual awards evening. Well led by Steve Trembath and with leading run scorer Luke Carter in the top order, the Broadstone outfit deserved their prize. The two teams who came second and third in Division 1 last year took the two top spots in 2017. 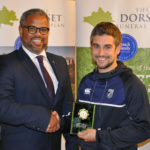 Christchurch have a Premier League set-up, but were pipped to the top spot by Bere Regis who have been on the verge of promotion for the last six years – but this year dominated with 44 points separating them from Christchurch. Division 2 also went down to the wire and was a final day shoot-out between two clubs who previously have graced the Premier League. In the end Portland Red Triangle saw off the challenge of Compton House. 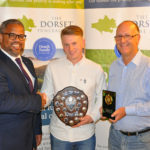 The runners-up in Division 3 were 7th half way through the season, but six wins in the second half saw Beaminster clinch second place. Continuing their remarkable rise through the league and winning the Div 3 title by a whopping 81 points were Charlton Down who went through 2017 unbeaten. Puddletown who were promoted to Division 4 in 2015, consolidated last year and this time round were runners-up. Beating them to the title were Shaftesbury who lost just one match all season. 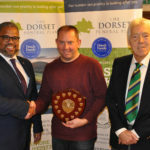 Runners-up in Division 5 were the only team in the whole of Dorset Saturday and Sunday cricket who didn’t lose a game to the weather – Portland Red Triangle 2nds. 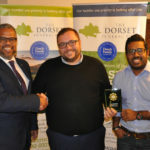 The winners of Division 5 had been relegated last year, but bounced back with a great season – Swanage 2nds. Bradford Abbas lost just two games all season in Division 6, but couldn’t move into the top spot which was occupied for the almost the whole season by Bere Regis, who lost only one game. 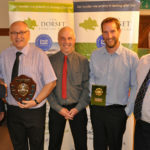 There were also some special awards presented at the evening held at Wimborne and Colehill CC. 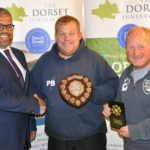 The groundsman’s award saw Shroton and Wimborne and Colehill receiving special mentions, but the winner was Hamworthy Recreation, with Gavin Fisher picking up the trophy. 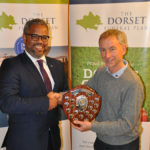 There were two fair play awards handed out at during the evening by Merrick Wilkinson, chairman of Dorset Association of Cricket Officials (DACO). 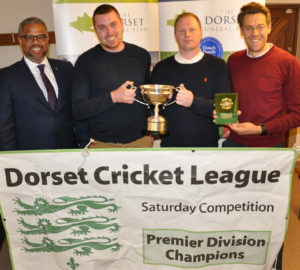 Cerne Valley won the Division 1 award while Stalbridge won the award for the Premier League. 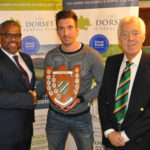 The Achievement award was won by Simon Proffitt of Portland Red Triangle who took 42 wickets including a seven wicket haul, a six wicket haul and three centuries. 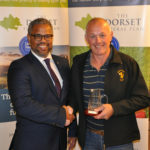 Club chairman John Walker picked up the trophy on his behalf. 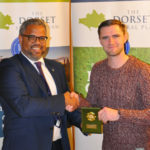 And the team of the season award saw special mentions for Bere Regis, Swanage and Broadstone but the winner is a club that started life only 12 years ago. 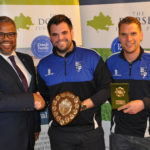 Charlton Down had an unbeaten season and recorded their fourth successive title and deservedly took the team of the season award. 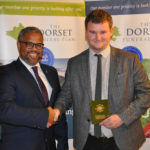 John Ridout, chairman, of the league, thanked the sponsors – The Dorset Funeral Plan – and said: “It was great to see many new faces at the awards evening and celebrate a season that saw plenty of exciting finishes. 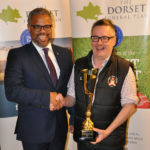 Nick Douch, from the sponsors, said: “We’ve been sponsoring Dorset cricket for more than ten years and my family’s association with Dorset cricket goes back many decades. 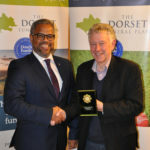 Nick Douch, left, of sponsors the Dorset Funeral Plan with John Walker, chairman of Portland RT, picking up the performance award for Simon Proffitt. 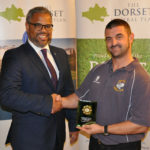 Nick Douch, left, of sponsors the Dorset Funeral Plan with Gavin Fisher, groundsman of the year. Hamworthy. 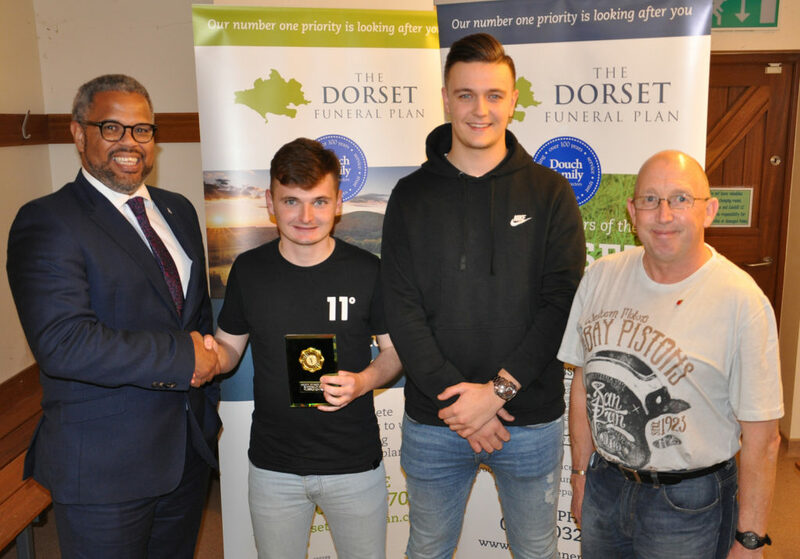 Nick Douch, left, from the Dorset Funeral Plan and John Block of Beaminster. Div 3 runners-up.